Having been in the fencing business for over 25 years means that we've seen and done a lot with fences. Whether your existing fence needs a little straigtening, painting, staining, simple extentions or major repairs, we can take care of it. It doesn't matter what material type or style of fence you have, because we have access to hundreds of different stock materials for that perfect match. In addition to all things fence, we also sell and install a variety of garden products such as garden borders, arbors, trellises. 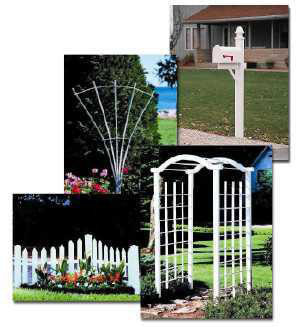 We also have a wide selection of posts, both wood and vinyl, for mailboxes, clotheslines, and lamps. Do you need new railing and decking? Again, we have a wide selection of both vinyl and wood materials to choose from. Please contact us to find out what we can do for you.